Blocked toilets can become a major inconvenience when it arises. This could be due to items that are not flushable such as wet wipes, pads, paper towels, excessive toilet paper and so forth. Crown Plumbing Specialists uses state of the art equipment to find the issue should it not be rectified with a plunger. 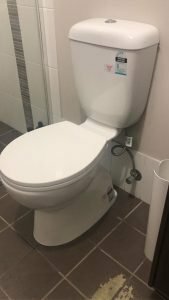 So if you are stuck and need assistance with a blocked toilet call Crown Plumbing Specialists.